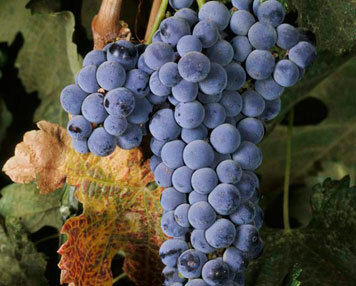 Merlot is a red wine grape that is used as both a blending grape and for varietal wines. The name Merlot is thought to derive from the Old French word for young blackbird, merlot, a diminutive of merle, the blackbird (Turdus merula), probably from the color of the grape. Merlot-based wines usually have medium body with hints of berry, plum, and currant. Its softness and “fleshiness”, combined with its earlier ripening, makes Merlot a popular grape for blending with the sterner, later-ripening Cabernet Sauvignon, which tends to be higher in tannin. Along with Cabernet Sauvignon, Cabernet Franc, Malbec and Petit Verdot, Merlot is one of the primary grapes in Bordeaux wine where it is the most widely planted grape. Merlot is also one of the most popular red wine varietals in many markets. This flexibility has helped to make it one of the world’s most planted grape varieties. As of 2004, Merlot was estimated to be the third most grown variety at 640,000 acres globally, with an increasing trend. This put Merlot just behind Cabernet Sauvignon’s 650,000 acres. Merlot, the object of ridicule in 2004’s sleeper hit, “Sideways,” is produced in over 480 California wineries, including Amuse Bouche in Napa, Birdstone in Madera and Kalyra in Santa Ynez. By the way, Sandra Oh, one of Sideways’ stars, poured at Kalyra in the movie.